Lots of strange things have been thrown on the pitch during matches this season alone. Toy pigs, dead rats, a severed bull’s head—but the dozens of plastic dolls Rosario Central fans threw on the pitch during their match against Racing might be the creepiest yet. Last week, Rosario Central beat their rivals, Newell’s Old Boys, in the Rosario derby. 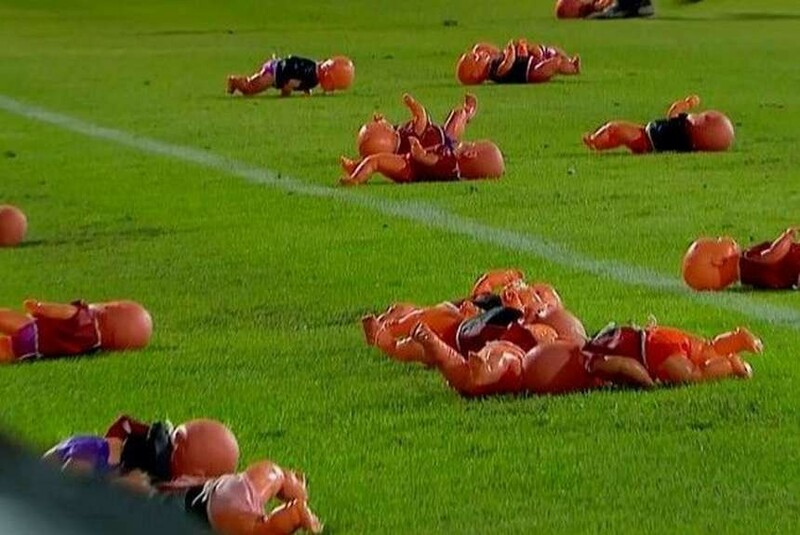 So in their next match, they decided to throw dolls dressed in Newell’s colors onto the pitch midway through the first half of their match against Racing. Because why not? As a result, it looked like it was raining human babies. Naturally, match officials were forced to halt the match while the dolls were cleared off and everyone received mental health treatment for witnessing this unsettling display. Anyway, this must have quadrupled the sales of Argentina’s Creepy Generic Baby Doll Company. Congrats to them.